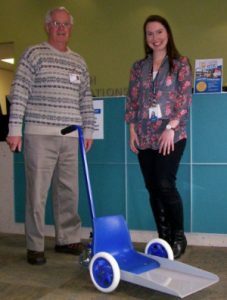 Volunteer Profile: Dennis McGovern - TADSA - Technology for Ageing and Disability (SA) Inc.
Dennis joined TADSA in 2007. Since then he has undertaken dozens of projects for TADSA clients. 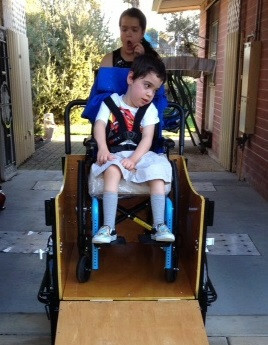 His speciality is modifications to four wheeled walkers and some of these have included: a one handed brake system for someone who was a stroke survivor, converting a regular walker into a gutter walker (raising and adding arm rests), reducing the height for a client with dwarfism, handle modifications to replace handles with a single bar across the middle, adding an oxygen bottle holder, adding a walking stick holder, and many more. Dennis has done so many walker projects that he has been nicknamed The Phantom (whose real name was Mr Walker). 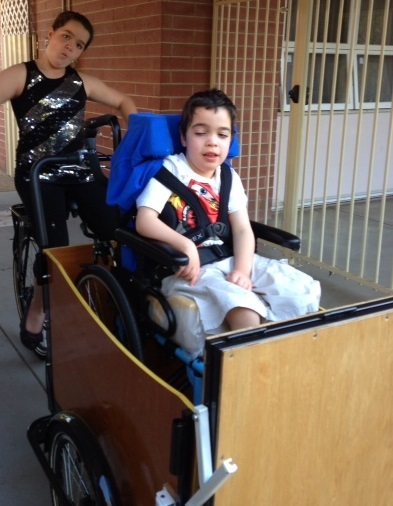 Dennis is pictured delivering a castor cart he made to Amy Martin from Novita. I was a volunteer at the Phoenix Society for nearly nine years helping with machine maintenance. When I left this position, I was looking for another volunteer opportunity where I could use the skills I’d developed during my working life. I saw an ad in my local Messenger paper and it sounded perfect. Volunteering with TADSA allows me to help people and to be creative in problem solving. I was apprenticed as a fitter and turner to Woodfast Machinery Company, then worked for several machinery companies. One I managed made equipment for Mitsubishi Australia and another made equipment for the building of the Sydney Harbour Tunnel.